She is a rose that glistens in the morning that moves the heart to say, “how beautiful” to the Creator. She is the sunrise over the sea that invites the heart to be in touch with the beauty of the God within. She is the gentle breeze that calls the heart to dance with joy and gratefulness to God, the Spirit moving through creation. She is the laughter that vibrates through the weary and anxious hearts in community with the blessings of peace and tranquillity. Sister Lusia Tuimavave was born into a very closely knitted family of 14 children: 7 girls and 7 boys. Lusia was the second born and the first of the 7 girls so she had an important responsibility to help her parents take care of the other siblings. She first expressed her desire to be an smsm when she was 16 or 17 years old, but her dad asked her to find work first in order to help with the education of her brothers and sisters. At 21 years old she left for New Zealand, found employment and worked “industriously for long hours” as stated in a reference letter from one of her employers written in 1988. While working Lusia attended classes at a Technical Institute and sat for the New Zealand exams for Maths, English and Typing in 1988. She helped her parents to educate 9 of her siblings before she entered religious life in 1988. -	after first profession in 1991 she worked at Bethany House in New Zealand caring for the elderly and sick sisters there. 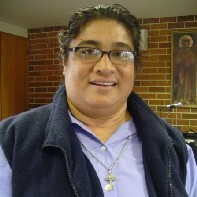 -	She attended Corpus Christi Teacher’s College, Fiji in 1994 and graduated in 1996 as a teacher. After this she returned to teach at St. Mary’s Primary School, Savalalo, Samoa where she taught for a couple of years. -	Then she was sent to American Samoa where she was Principal of the School at Lepua. -	In the year 2000 she responded to the call for mission in Kiribati, to teach at St. Louis Secondary school and she taught there for 7 years. She gave herself wholeheartedly to the students and continued to provide individual help to many of them after they completed their studies at St Louis and were struggling with their studies at the USP. 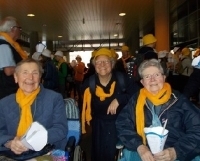 Sr. Lusia was always available for them. -	In 2004 she attended the Catholic University in Sydney for a degree in Education. After this she went back to Kiribati and taught there until she was voted in as one of the Provincial councillors in 2008. 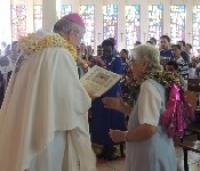 Sr. Lusia loved Kiribati and teaching and she was a gifted teacher and the students loved her very much. Even when she was lying in bed and feeling very sick with the effects of the chemotherapy she was getting for cancer she would go onto the internet to help the I-Kiribati students studying nursing in Queensland with their assignments. 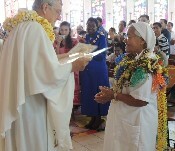 As a councillor she returned to Kiribati in August 2009 to teach at St. Louis so that Sr. Kateia Kaikai could go for a 30-day retreat in Fiji. She returned to Sydney on the 22nd of September very sick and was taken straight to the hospital. Gradually her condition continued to go down hill. She resigned as Provincial Councillor in October 2009. 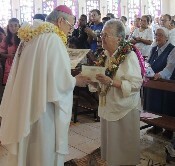 Between going back and forth to Doctors and receiving chemotherapy Sr. Lusia took time out to teach catechism and prepare some of the Samoan children for the Sacraments. During the last weeks of her life with us, her brother, Mikaele who is a Marist Priest came over from Samoa to see her and a couple of times we had Mass in Sr. Lusia’s room at the Palliative Care Unit at St. Joseph Hospital, Auburn. 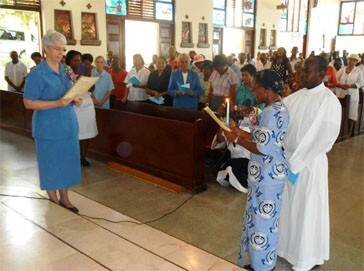 And Lusia would join in the beautiful harmonious singing of the Samoans hymns. Her sister Selina came over from New Zealand as well as cousins who are Nazareth religious sisters to be with Lusia during her last days. Another brother came over from the States but Lusia died 2 hours before the plane landed in Sydney. Her other sister Evelina in Hawiai was in the process of coming but Lusia died before she got here. One of her brothers Pio and family had moved a year or so ago to live in Sydney and so she was very much surrounded by members of her natural family and religious family during the time of her illness and death. Throughout her illness she rarely complained, although it was difficult for her to accept her condition as she felt she had so much to do for God here on earth. She was a heroic and a courageous woman to go through what she went through and a great inspiration to us. Sr. Lusia knew her time to go to God was near though it was not easy for her to accept it. The last word she uttered before she could not communicate anymore was “thank you”. You know the way; your way is love. 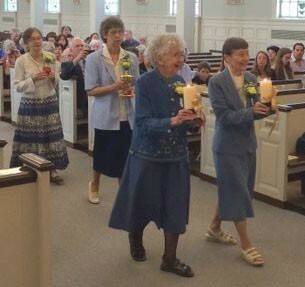 Thank you Sr. Lusia for the gift of yourself to the congregation and to life. We will miss you. May you now rest in peace with your God.